If you’re like me, during these peak weeks at the market, the bounty comes with a side of panic. Did I pick up enough tomatoes? Enough corn? Enough peaches? Enough apricots? Too many apricots? Will they turn to mush before the girls can finish them? Will that ginormous bushel of summer spinach go sad and wilty before I figure out a way to use it? In other words: Am I making the most of the season? Because in a few weeks, when the tomatoes return to styrofoam and the plums always come with a sticker affixed to their skins, the image of me passing over that Mr. Stripey heirloom will haunt me. A partial solution to this problem has been to turn my kitchen counter into a Rich Man’s Salad Bar for dinner. You can really pack in the veggies that way. These are seven of my recent favorites (you can mix and match as few or as many as you like) and while I’m not going to stop you from serving them alongside a piece of grilled meat or fish, they are all special enough to be the main event…so all you really need is a nice loaf of crusty bread. White Beans and Kale (above) I soaked dry white beans overnight then boiled them the next day to make this, but you could just as easily use canned cannellini or Great Northerns. To make: Saute a small bunch of washed, chopped kale with garlic and red pepper flakes in olive oil over medium heat until slightly wilted, about 2 to 3 minutes. 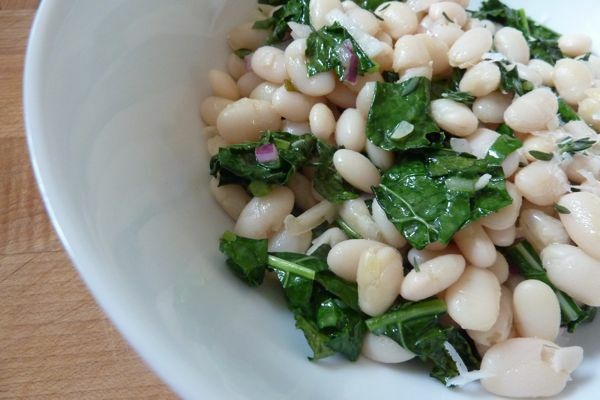 Toss kale with beans, 2 tablespoons of chopped red onion (or to taste), a generous shaving of Parmesan, olive oil, a squeeze of lemon, salt, and pepper. Beets and Goat Cheese Lucky for us, this one falls in the Pink Food Category. Phoebe likes beets without the cheese. Abby likes beets for painting bright pink lines across her plate. To make: Remove stems from beets. Roast them at 350°F for 35 minutes. While they are cooking, add a drizzle of heavy cream or half-and-half to a small log of plain goat cheese and stir/mash together until cheese is slightly fluffy instead of crumbly. Once beets are cool, peel and chop them into a fine dice as shown. Top them with goat cheese “fluff,” fresh thyme (or tarragon), freshly ground pepper, and a drizzle of olive oil before serving. 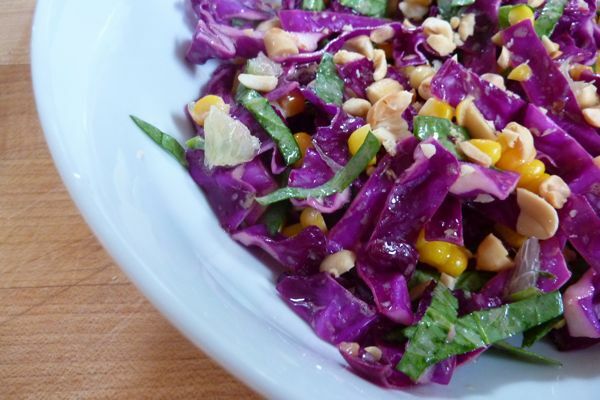 Cabbage and Corn Slaw. You might remember this from last week’s Sunday Barbecue Chicken Menu. 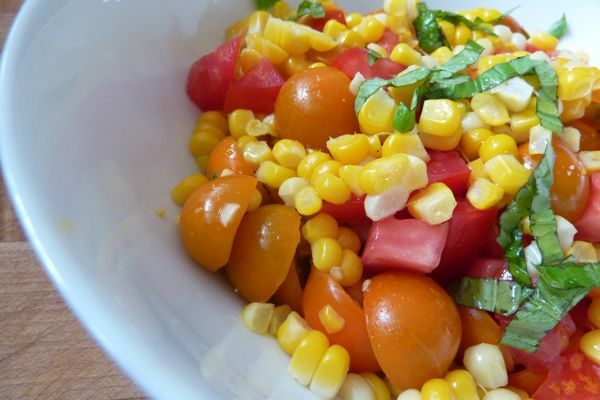 Simple Corn-Tomato-Basil This time of year, you should be arrested for not having some version of this salad on the table. As with all superfresh, superpeak produce, you don’t need to add anything to the vegetables beyond olive oil, splash of red wine vinegar, salt, and pepper. Maybe a little red onion, but that’s it. Cook the corn or don’t cook the corn; either way it will work. 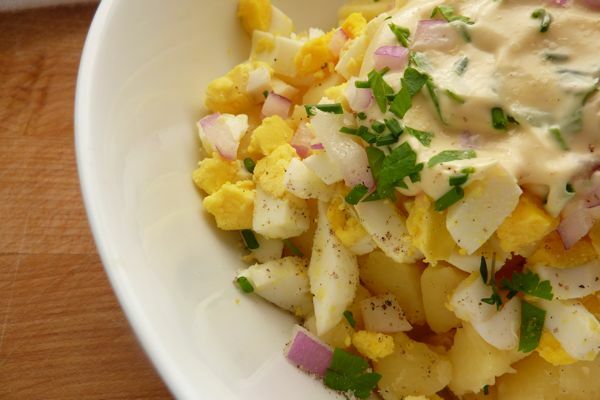 Classic Potato and Egg This was my favorite potato salad growing up. So much so that I’d make my mother prepare twice the amount so I could always have some for breakfast. (My argument: How is it different from eggs with hash browns?) To make: Hard-boil four eggs. (Add them to a pot of water, turn heat to high and as soon as the water boils, remove from heat and cover. They will be perfectly cooked after 12 minutes.) Boil about 9 or 10 peeled potatoes (yukon golds or fingerlings) for about 15 minutes (until a sharp knife easily slides through the flesh) and let cool. Dice finely and add to a bowl. Once eggs are cool, remove shell and dice finely. In a small bowl, whisk together about 3 big dollops of mayo and 1 dollop of Dijon mustard. Toss everything together along with chopped red onion to taste (I don’t like too much of it), chopped parsely, salt, and pepper. Simple Tomato Salad I made this for my parents this past weekend. Once we had served all the tomatoes, Andy picked up the serving bowl and drank the tomato juice like a man who just crossed the Sahara. Same basic rules as corn tomato salad above but minus the corn. Halved tomatoes, slivered basil, olive oil, salt, pepper. 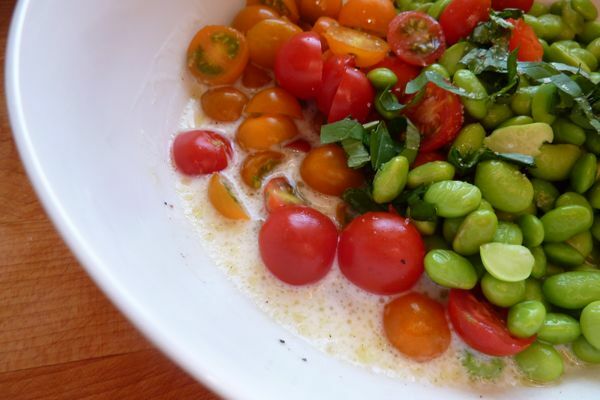 Soybean and Cherry Tomato Salad with Buttermilk This is the Lee Brothers special I’ve written about before. 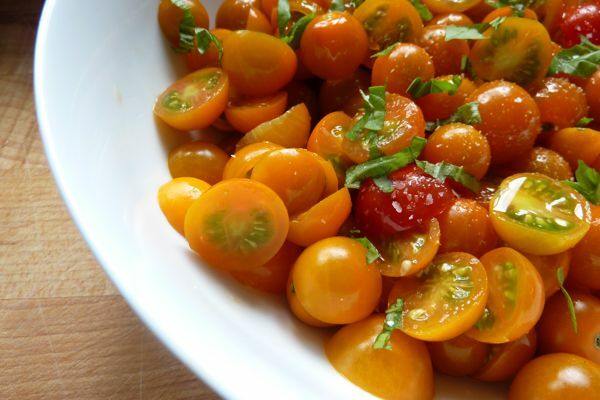 Now that it is tomato season, you really have no excuse not to try it. Hi Jenny. Do you think it would be possible to boil the eggs AND the potatoes in the same pot at the same time? Amy – Yes, I guess it is possible, but it might be one of those things that save you time at the expense of the egg. This technique for hard-boiling eggs never fails (never a wet middle or any green around the yolk’s rim) and I think the key is in the last 12 minutes that it is being cooked gently in hot, but not boiling water. I’m not sure how you would coordinate that with the potatoes which need to be cooked at a pretty aggressive simmer for the full cooking time. What you could do to save time though, is not drain the hot water from the pot that you cooked the eggs in…then just chuck potatoes in as soon as you remove the eggs. Sorry, hope this isn’t TMI. Thanks for writing! Love the salad bar ideas. I think I will make the corn and tomato salad tonight. Thanks for the inspiration. Amy- Interesting question – I might try that sometime. Hi Jenny. I’ve made the cabbage corn slaw twice in the past week and EVERYONE loved it! I think people were pleased to see something a little different at the table. You are great at this blog. I check it daily and I wasn’t happy until I had read all of your earlier posts. I love your creative spirit and keep telling people how much they will get out of checking out your blog! Thanks for all of the creative ideas and your wonderful spirit! If I had been at the table for that tomato salad, I would have leg wrestled Andy for the drippings at the bottom of the bowl. And given what was on the line, I would have WON. It’s a salad smorg! And I love it! You don’t even need to cook the corn, in my opinion. I often cut the corn from a fresh cob and we eat it raw. So sweet and yummy, and perfect in salads! Jenny, I know this is an older post, but I really hope you see this comment, because I need you to know that you converted an avowed beet-hater – in one night – to a major beet-lover. I adore beets, especially roasted, but my husband has always sworn he despises them, so I never make them. I made your roasted beets with goat cheese “fluff” tonight and – get this – he ate two enormous servings! He kept saying, “These beets! 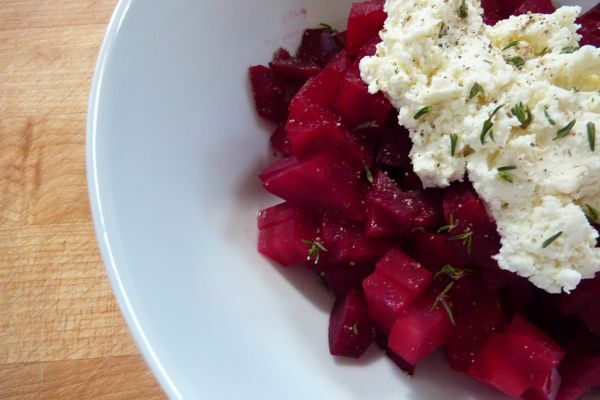 I love these beets!” You have yet again changed our dinner lives – thank you so much! We adore the blog and the book!